Now the fight turns to the Senate where the Republicans hold a (52-48) majority. We will need to convince at least two Republicans to oppose the "healthcare" bill in whatever form it ends up taking. 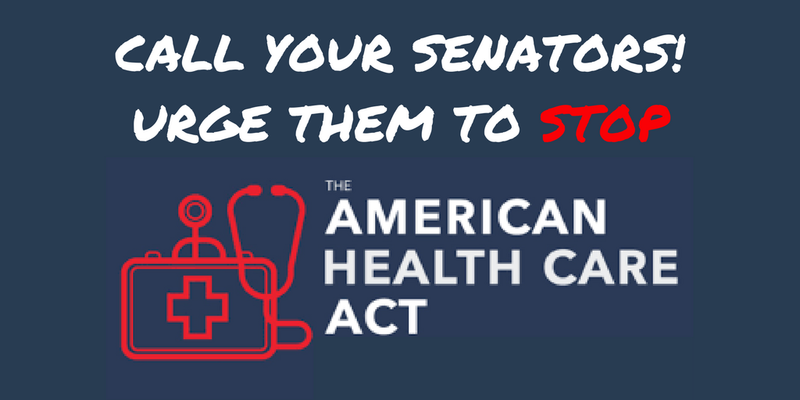 The Senate is likely to make significant changes to the AHCA before it comes up for a vote so your Senators need to hear from you today about healthcare. 1. Find your Senators' phone numbers here. Make sure to call them both. If you need to try their district offices to get through, please do so. If you live in AK, ME and OH this is especially important because Senators Susan Collins, Rob Portman and Lisa Murkowski are the three Republicans who are most likely to reject the AHCA/be reasonable about this whole healthcare thing. The Republican plan that was just passed by the House would take health care away from 24 million Americans over the next 10 years, especially the poor, elderly and SICK people. It would make premiums increase, making it harder (or impossible) for many to obtain coverage. It was pushed through too quickly (again) to allow the non-partisan Congressional Budget Office score it. I will most definitely be looking to the Senator's vote on the healthcare bill when I cast my ballot in the next election. 3. Tweet at your Senators and post on their Facebook pages. 4. Share this email with three people and ask them to take 5 minutes to join you.